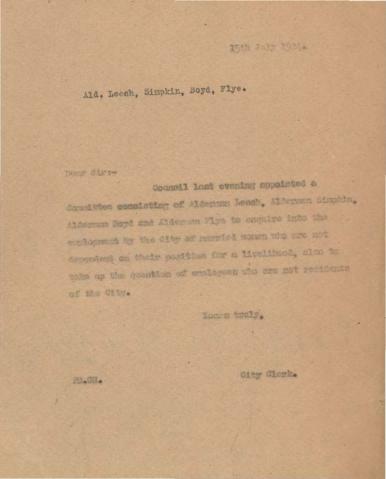 The Special Committee to Enquire into the Employment of Married Women was appointed by Council on July 14, 1924 to determine how many married women were employed by the City. The Committee was also required to gather information regarding residency for all City employees. Based on a detailed survey of City departments, the Special Committee recommended to Council and Council adopted a policy of not engaging married women if they were not dependent on their work to manage their affairs and of not engaging any help resident outside the City. The Special Committee was composed of four aldermen. No file code was assigned to this special committee. Forms part of Fonds 1. Series consists of communications and detailed reports from City Departments noting the names of all City employees, identifying in particular married women employed by the City and City employees who were not residents of the City. The records are contained in one folder and cover the period July - September of 1924.